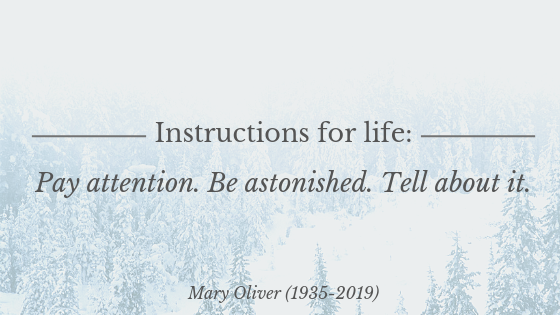 It is with a heavy heart that we devote this post to Mary Oliver, one of the most prolific poets of our generation, who passed away this week after her lengthy battle with lymphoma. Mary was a rare poet. She made poetry accessible, Her words, whether read aloud or spoken inwardly while our eyes flit across the page, inspire us to feel more, to do more, with our short and fleeting lives. From her poem, The Summer Day, on the surface she describes an encounter with a grasshopper. Yet her meaning is much deeper, encouraging us to meditate on our own lives and our place in the world; our fleeting existence; our relationship with the wonder that is nature. Thank you to my kind friend who taught me that contemplation is a far greater tool than escapism when trying to work through life's problems, and introduced me to Mary Oliver's work just a few months ago. Though saddened by her death, we can take solace in her musing that "maybe death isn't darkness, after all, but so much light".